UAE take on Qatar for a place in the final of the Asian Cup on Tuesday evening, with the weight of expectation firmly on the hosts. The Whites will be backed by a boisterous home crowd at the Mohammed Bin Zayed, and a full house should be expected. Alberto Zaccheroni’s side may have not been at their very best on their run to the semi-finals but they seem to be hitting their stride right when it matters. The first half against Australia was arguably the hosts best period of football under Zaccheroni. Composed in defence and resolute on the counter they looked completely different from the side that needed an extra time goal to squeeze past Kyrgyzstan. Then in the second half, the UAE picked their moment against Australia pouncing on a Milos Degenek mistake and Ali Mabkhout make the 2015 winners pay with a tap in. Then, it was all about shutting the Socceroos out, which was done with aplomb. However now the contest against Qatar will poise a dilemma for Zaccheroni. Both teams have thrived in this tournament without the ball, with both the UAE & Qatar preferring to forgo possession and strike on the counter. It’s clear that both sides won’t be able to do this in the Semi-final, so it will be interesting to see how veteran tactician approaches the game against their local rivals. As for Qatar, they are breaking new ground in what will be a first-ever appearance in the Semi-finals of the Asian Cup. 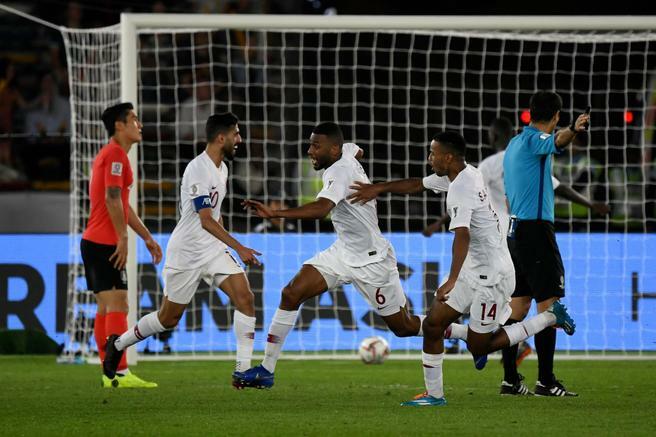 Against the odds, Al Annabi kept out Son Heung-min and South Korea before Abdulaziz Hatem found the bottom corner with a scorching long-range strike to hand the 2022 World Cup Hosts the win. Again, Qatar exhibited similar a defend at all costs attitude that the UAE did to frustrate and ultimate hold out South Korea. The victory against is further underlined by the age of the side. Salem Al Hajri at 22 put in an assured performance in midfield, Tarek Salman, 21 looked composed beyond his years alongside a 21-year-old Bassem Al-Rawi. Although the absence of the Al Duhail defender will be a big blow for Al Anabi heading into one of the biggest matches of their history. Although the return of Abdulkarim Hassan and Assim Madibo will be a relief to Felix Sanchez. The odds have always been against Qatar in this tournament, considering the ongoing political situation in the Gulf. However, you have to credit Sanchez and the squad on how they have just focused on the task at hand, and gone about just simply playing football. No doubt the mind games and noise around the match against the UAE will intensify and just like the Saudi Arabia game, Sanchez will protect his young side. Regardless of the result, they should be proud of how they have played and this should be a marker for success heading into the World Cup cycle. It certainly promises to be a fascinating encounter as the UAE face off against Qatar for a place in the final of the Asian Cup on the line. You can follow all the action Live & Exclusive on MAX HD 1.